Happy Monday beautiful people! I had a relaxing weekend and it was all about hubby and I. We dropped off Nolan at grandma’s on Friday evening and he was excited to say “bye momma and daddy”. He definitely had a fabulous time and so did we. We however missed his nonstop chanting of “momma and daddy”. On Saturday, hubby and I headed to one of my favorite brunch restaurants i.e. Miss Shirley's Café and I posted clips on my Instagram and snapchat (Jadore-Fashion). As usual, I ordered my favorite Coconut Cream Stuffed French Toast with a Maryland Omelet...I was beyond stuffed! If you are ever in Maryland, I recommend the restaurant. In the evening, we saw the movie “Sicario” starring Emily Blunt and Benicio Del Toro; the last time hubby and I went to the movies was in January. 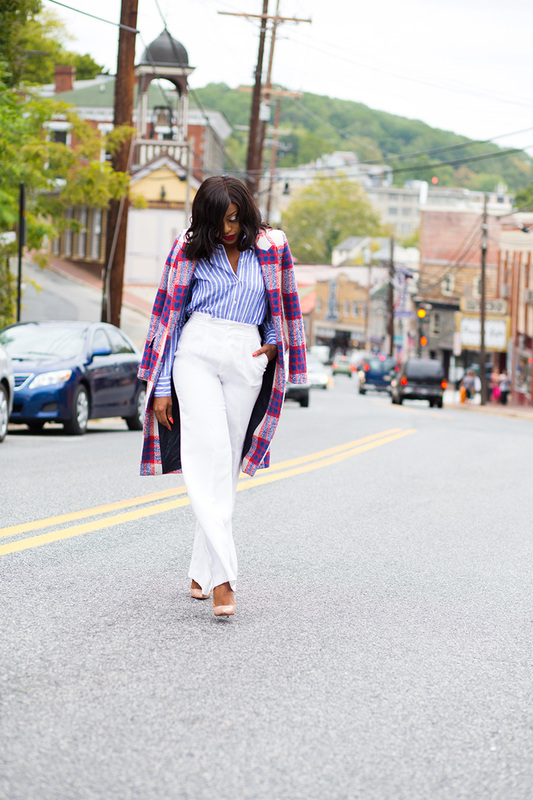 Today's look is all about mixing prints for the fall and you can definitely wear white after Labor Day. 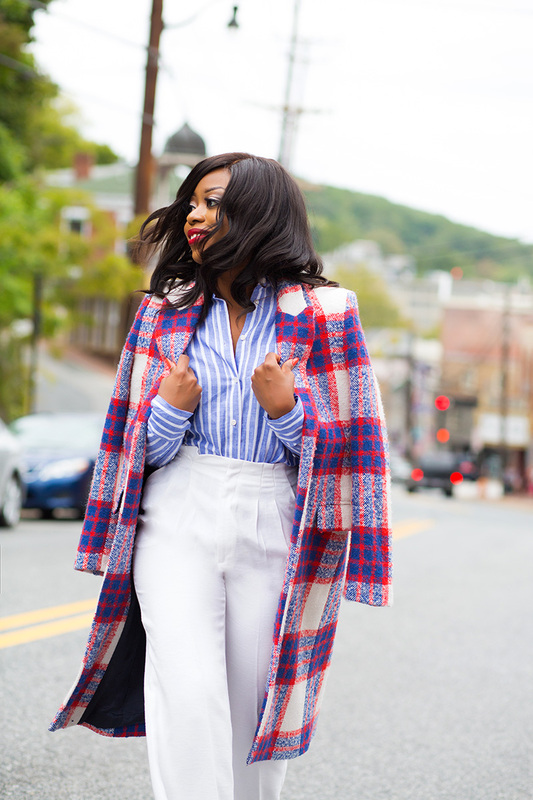 I paired my favorite wide leg trouser with a blue stripe button down shirt and completed the look with a print coat. I wore the coat as the “blue” complements the color of the shirt. The red color on the coat seamlessly creates a vibrant outfit. Thank you always for stopping by, have a wonderful week! I love your style. 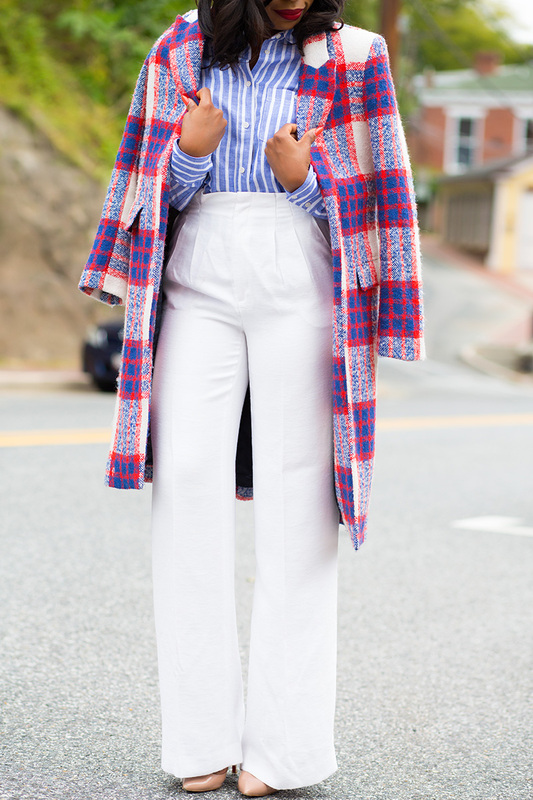 I especially love how your pants pop and you not only mixed colors but prints too. Love it. Would love your feed back on my blog as well!! 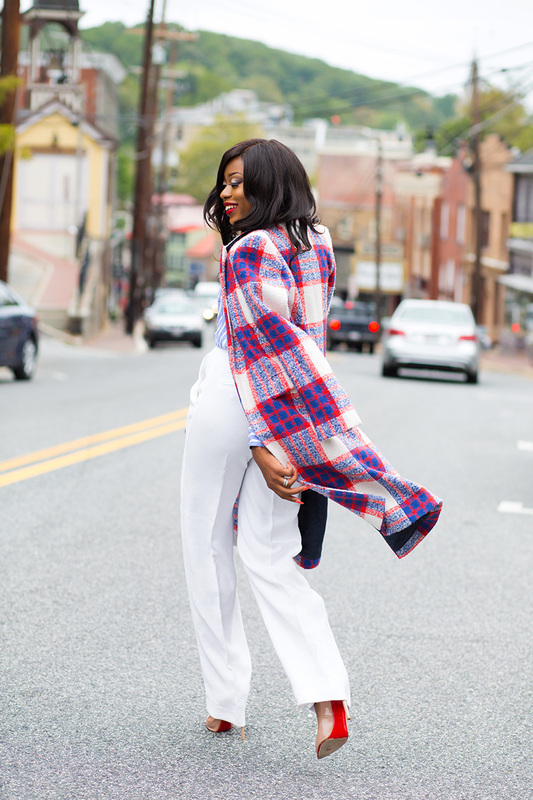 Love this look....white is such a beautiful color to play with because it makes any outfit look crisp! The bold patterns of your coat is just lovely to add some interest to the whole outfit. What size are you wearing in these pants? I'll love to get a pair. You blew me away with this look, you look really chic is in this and that coat is a very beautiful addition. I am usually scared of white pants and shoes, don't know why.